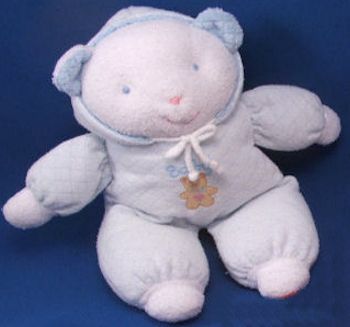 I’m looking for an Eden white baby teddy bear wearing a pastel blue hooded outfit made of inside out waffle texture chenille. The word Baby and a brown teddy bear are embroidered on the chest. I had one since infancy that I loved and hoped to keep forever, until sadly, I lost it on a family vacation. The room service wasn’t exactly careful when changing the sheets, and somehow my poor bear got caught up in the sheets and got lost. I’d really love to find a new one just like it. I’ve looked everywhere, and I’ve finally found one here! I have found ones on ebay on occasion…would also like one. Really? Thank you! I’ll check there again.